Toward the end of Stravinsky’s “Russian” period, before he dove into Neo-Classism and twelve-tone music, he wrote a rather unusual non-symphonic piece for four pianos, percussion, and a full chorus. Like Stravinsky’s The Rite of Spring, Les Noces (translated as The Wedding) was composed for the Ballets Russes. It premiered in the Parisian Théâtre de la Gaîté with choreography by Bronislava Nijinska in 1923, though Stravinsky had been working on different versions of the cantata since as early as 1913. Looking for a new and ambitious project, local composers Dominique Leone, Kanoko Nishi, and Regina Schaffer decided they were going to tackle Les Noces and make a difficult work even more difficult by arranging it for just two pianos and five voices. Their goal was to stay as true as possible to Stravinsky’s score and capture the fullness of the original arrangement with a much paired-down ensemble. 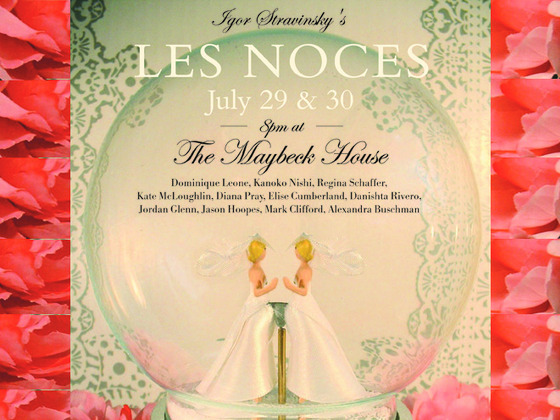 We’ll find out this weekend when the ten-piece Ensemble Épouser premieres Les Noces at Berkeley’s Maybeck House. Meanwhile, take a listen to this remarkable recording with Nishi and Schaffer on piano and Leone doing all the choral parts, including the soprano, mezzo-soprano, tenor, and bass soloist parts. In case you’re wondering how that was possible, Leone uses a computer pitch shifter to reach all the high and low octaves that are outside his natural range. He also uses voice amplification pedals to double or triple the voice and thus give the effect of a chorus. The recording is all the more remarkable once you understand the circumstances under which it came into existence. “Dominique actually tricked us into doing the recording!” says Nishi with a laugh. While she and Schaffer were still just learning the grueling piano parts, Leone spent a month recording them, often only eight bars at a time, apparently for “a demo” to help him learn all the vocal parts. “It was a very arduous process of stopping and starting and stopping and starting,” says Leone, who later edited all the piano parts together and then recorded the voice parts over them. After Nishi’s initial surprise when Leone released the recording, she was very pleased with the results. However arduous recording Les Noces may have been, this weekend’s live performance of the piece presents its own set of challenges. As Leone explains, the five singers will be continuously switching in and out of different choral and solo parts with no rest, like they would normally expect to have in a choral performance. They will also have to deal with a lot of the same kind of technology Leone used in the recording, which presents somewhat of an onstage logistical quandary. This, of course, is all part and parcel of what attracts these music adventurers to such a formidable project. While Leone has been a fan of Les Noces for many years, Nishi was unfamiliar with Stravinsky’s choral work till Leone proposed the collaboration. When she first hear it, she too immediately liked it. Friday and Saturday’s performance of Les Noces will be conducted by Kate McLoughlin with Diana Pray (soprano), Elise Cumberland (mezzo-soprano), Danishta Rivero (alto), Dominique Leone (tenor), Alexandra Buschman (bass), Kanoko Nishi and Regina Schaffer (pianos), Jordan Glenn (percussion), Jason Hoopes (bass), and Mark Clifford (mallets). Stravinsky’s Les Noces by Dominique Leone, Kanoko Nishi, and Regina Schaffer will be performed at 8pm on July 29 & 30 at the historical Maybeck House in Berkeley. Advance tickets can be purchased here.